The Sweetpeas and Me ~ avoiding the washing up: Ever wanted to earn money sitting at home on the computer? Ever wanted to earn money sitting at home on the computer? A couple of friends and I did a little experiment last year to see if we could get our Christmas for free. We wanted to try out different sites and see which were worth it in terms of effort and payout. You've all heard of the "get rich quick" schemes right? Well, ours is the "plod along and it'll work" scheme. Every day we do a few clicks here and there on different sites which all add up to one marvellous Christmas. It really can be achieved. I'm talking about buying presents, sorting out the giftwrap and cards and even purchasing your turkey and all the trimmings just buy doing a few clicks daily. This is a very simple site to use. The routine I do each day is to click on the Daily Poll and answer it. This can be found on the left hand side under the To Do List heading. Earnt so far, 1SB. SB stands for Swagbucks and is the points system on that site. I collect Amazon vouchers which currently cost 849SB for a £5 Amazon e-voucher. Next in the routine is NOSO. This is also found on the To Do List. Click it and then go to start earning now and then just keep pressing "submit and continue to next offer" until you get to the captcha page. Pop that in and that's another 2SB earnt. 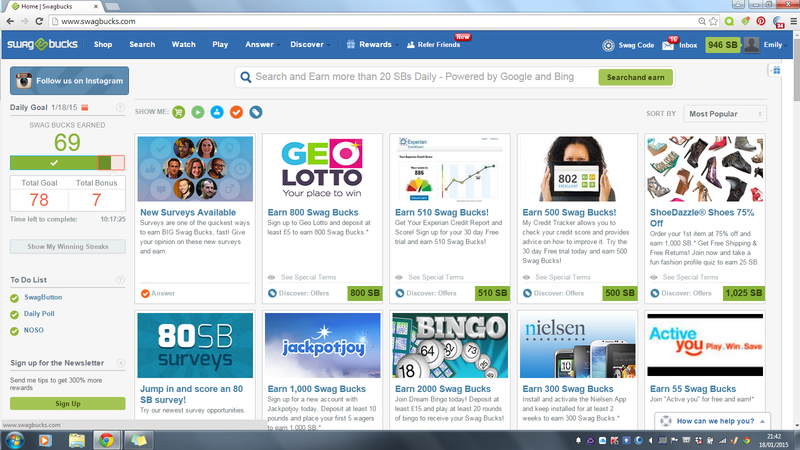 Games on Swagbucks can also be played each day. You can only earn a maximum of 10SB each day playing them so once they are earnt, carry on to the next task. This routine for Swagbucks takes about the same time for a kettle to boil. Easy hey? If I have any more time in the evenings when The Sweetpeas are in bed, I then get started with some surveys. These can be found in the Answer tab along the top of the homepage. Just click it and then press on Surveys in the drop down box. You may get disqualified from some of the surveys but the ones that you do complete can be worth quite a few SBs. You can also click on search at the top of the homepage. This is simply a normal search engine but every now and again a banner will appear giving you some extra SBs. You just pop in the captcha code and the SBs are instantly added to your account. These can be quite lucrative with them ranging from just a few right up to over 40SBs in one go. Lots of people try to aim for the target that Swagbucks sets each day. This can be found on the top left hand side of the homepage. If you complete the target for that day you will get the corresponding bonus swagbucks applied to your account the following month. So if you look at my screenshot below, you can see that I'm currently on 69 Swagbucks earnt and my 2nd goal for the day is 78. If I now reach 78, next month I will earn a bonus of 7SBs just from today. So that's Swagbucks. Plod along and earn some of these fabulous rewards. Swagbucks offers a fantastic referral system too. If you click on Refer Friends at the top your own referral link will appear which you can give to your friends when they want to sign up too. (Trust me, they will when they see what can be achieved!) The benefit for helping your friends out with the site is that you will earn 10% of whatever they make on there. This is at no cost to the amount of swagbucks they make, it's just extra for you. What I'm trying to say is, that no-one loses out by going through a referral link and it simply helps out the person whose link you use. This is mine. I wish you all the very best with your Swagbucks journey. If you have any questions, then please leave them in the comments and I'll get back to you. Now, who is ready for the next site?